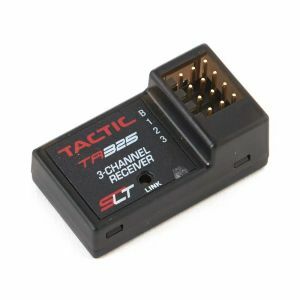 Tactic TR325 2.4GHz 3-Channel Receiver. FEATURES Compatible with the Tactic 2.4GHz transmitters and any transmitter featuring the SLT logo. For RC surface vehicles including car, truck, buggies and boats. Built-in bind button with red LED status indicator. Automatic fail-safe returns all servos to center, and automatically resumes normal function when signal is reacquired.